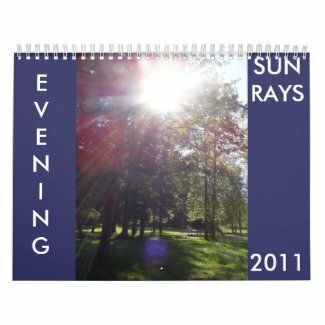 You are currently browsing the tag archive for the ‘2009 calendar’ tag. 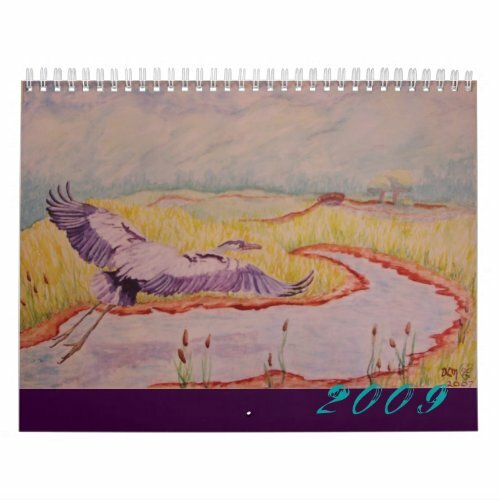 I just got done designing a calendar for 2009 featuring my artwork, and since it is customizable it can be printed for any year you choose! 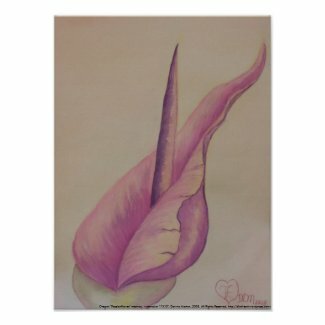 Check it out in my Zazzle Gallery. 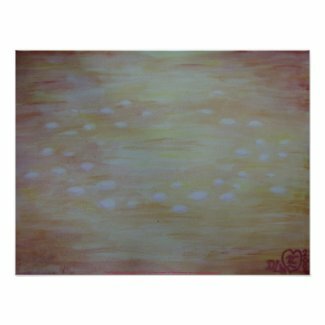 For January I chose Midsummer Daydream ( Water soluble oils on gessoed paper, 14 3/4″ x 11 1/4″ 2007) in which the wood sprite creates ripples in his refection as he daydreams, and fairies dance on the lily pads and skate across the water while his leaf boat floats away to dreamland. This painting makes me think about moving beyond anything that might be holding me back from reaching my true potential, reaching for my goals, and changing my own view of myself as I strive to become the person i want to be. .I likeGnat Creek Flowers (Watercolor on paper, 9×12″, 2008.) for March. Along the borders of Gnat Creek Oregon a tiny white wildflower blooms in front of a rock, basking in the summer sunlight. I love the warmth of the sunlight on the mottled looking rock contrasted with the cool purplish shadows and the impressionistic background of lush vegetation. April features Water Fairy Ring (Watercolor on Bienfang 140lb paper, 11X15″, 2008 ). Like a fairy ring these water plants appear to float magically suspended in the sunlit reflections of the water. Spring Apple (Acrylic on canvas, 5×5″, 2008) brightens up the page for may. 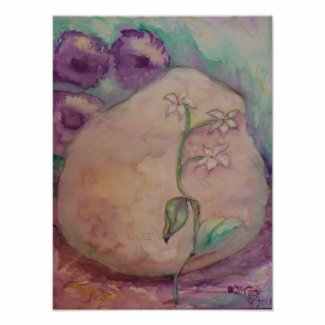 A spring apple and apple blossoms on an impressionistic green and purple background is energized with a splash of vibrant sunlight.
. June showcases SING Redeeming Love! (Watercolor on 140lb cold press paper. 9 x 12″, 2007). In SING Redeeming Love, Missionaries sing a song of joy, love, and redemption as they seek to find wandering sheep in the desert. As lost sheep are found, they begin to feel joy as they enter the way. Those who remember the great mercy of the Savior for them are filled with the love of Christ, feeling compelled to sing redeeming love with joy that cannot be contained. They desire to share the Gospel of Christ with everyone, that they might also be filled with joy through the Redemption and love of Christ. This also refers Alma 5:9, 26; 26:13 and is a reminder and an invitation to feel to”’sing the song of redeeming love’ and mean it as much now as in any past year and as much tomorrow as today!” (Spencer W. Kimball, “‘The Uttermost Parts of the Earth’,” Ensign, Jul 1979, 2). In JulyMichael at the Waterpump. (Water soluble oils on gessoed paper. 11 1/16″ x 15 1/16″. 2001) features nature, camping and family togetherness as Michael discovers the joy of an old fashioned water pump after feasting on huckleberries in the forest surrounding Oakridge, Oregon. Fly away in August with Flight of the Great Blue Heron (Watercolor on gessoed paper, 14 3/4″ x 21 3/4 “, 2007). Like a prayer that lifts us up from our troubles to see a glimpse of the beauty and majesty of god’s plan for us, the great blue heron takes flight from the marsh towards the footbridge and the misty mountains beyond. Enjoy tranquility during October with Oakridge Reservoir #3 (Watercolor on Fabriano Uno 300 lb Soft Press 100% cotton paper, 7 1/2″x 11″, 2001). Sunrise over Oakridge Reservoir, on a tranquil Oregon morning. Smooth as glass, the water mirrors calm reflections of driftwood and a fishing boat. Peace and solitude as the day breaks over the cool blue mountains. 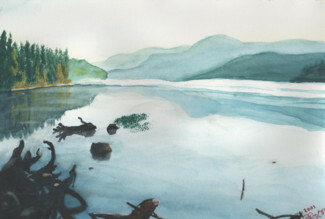 November andOakridge Reservoir #4 (watercolor on Fabriano Uno 300 lb Rough 100% cotton paper, 7 1/2 x 11″, 2001), with it’s gnarly dead tree stump surrounded by weathered gray branches juxtaposed against a view of algae and rocks under the vibrant blue water of Oakridge Reservoir and it’s forested green Oregon mountains framing hazy blue mountain ranges in the distance, bring to mind thankfulness for what is past and hope for the future. .December featuresOakridge Reservoir #2 ((watercolor on Fabriano Uno 140lb hot press 100% cotton paper, .7 1/2″ x 11″, 2001). Upended tree roots protrude from the shore of Oakridge Reservoir. A lone twig sticks up from the water. Algae and tree stumps seem to float as the water deepens. Green and gold, the colors of the forest shimmer in the water as the cool blue Oregon mountains beckon in the distance. 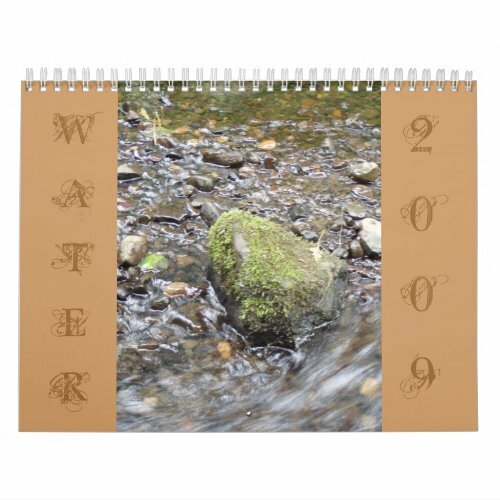 2009 calendar featuring the photography of Dawna Morton. Great blue herons, double crested cormorants, ducks, and geese in the wetlands near the Columbia river in northwestern Oregon. 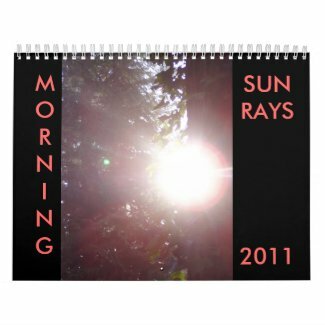 I just got done designing a 2009 calendar with some of my Early Morning Sun Rays photographs. 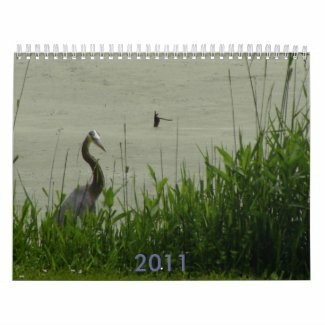 It is for sale at Zazzle.com.